Why Should I (Event Attendee) Download the Whova App? The Whova app supercharges your networking experience and expands your offline business connections effortlessly. When attending an event, you want to get the most out of your time while you’re there. It’s difficult to do that if you’re busy thumbing through pages upon pages of printed materials. The Whova app has an easy navigation and logistics system that enables you to plan ahead of time for a productive event. You can even personalize your own schedule to customize how you spend your time. 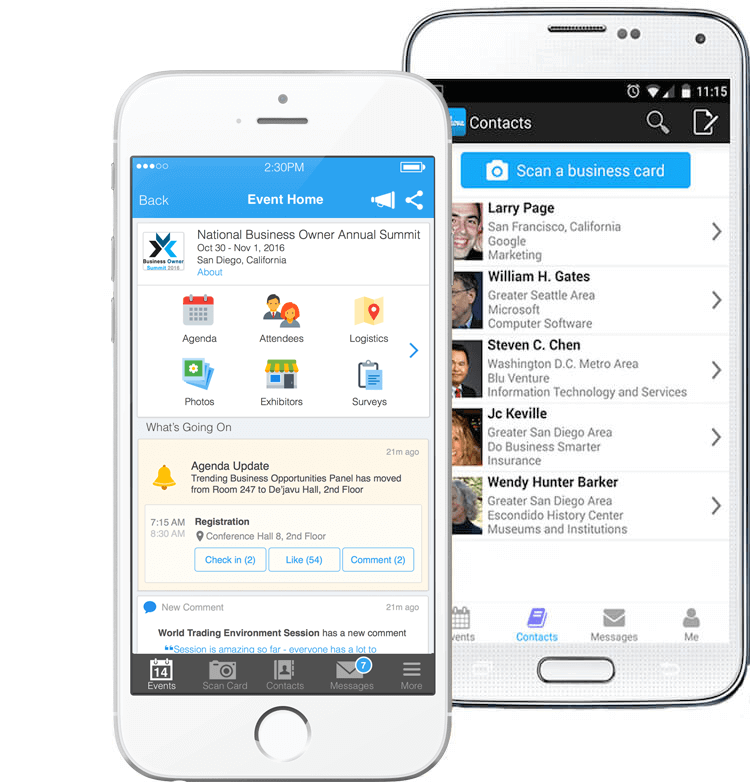 After the event, you’ll no longer need to keep stacks of business cards laying around–the Whova app’s business card scanner will enable you to store your new contacts’ information safely within the app. The Whova app is the only event app that provides this benefit. Bonus tip: you can scan business cards you receive anywhere, not just at an event. Build your network without ever needing to exchange even one paper business card. In addition to scanning traditional business cards, the Whova app enables you to seamlessly trade e-business cards with your desired connections, regardless of your physical location. This way it saves you time and results in paperless networking. The app gives you boundless networking time. Our SmartProfile technology auto-populates your profile within the app weeks before the event even begins. This allows you to start browsing other attendee profiles, messaging attendees, and growing your network weeks before the event begins. And you can continue to grow your network indefinitely. With the app, you can also connect with others through LinkedIn. Your network will know no bounds! With the easy-to-use Interactive Agenda, you’ll be able to check-in to sessions you want to join, letting other attendees know where they can find you, and you’ll be able to “like” sessions, letting others at the event know which information you enjoyed the most. Did a speaker or panelist bring up something that you’d like to start a discussion about? With the app, you will be able to leave a comment on a session and share your thoughts as well. The app makes it extremely easy for all users to effectively use social media. If you’d like to share your thoughts with others outside the event, but don’t have a Twitter account, you can use the Twitter tool within the Whova app. Your tweets will be published to Twitter, with the event hashtags automatically added. The Whova app enables you to join the Twitterverse even if you don’t have an account. When you’re busy enjoying yourself, it can be easy to miss announcements from the event organizers. With the app, you’ll receive real-time push notifications to let you in on important updates such as room changes, delicious snacks being served, or a reminder that the lunch break is almost over. Always be in the know. The Whova app is sustainable in two different ways: environmentally and economically. Event organizers save thousands of dollars because they no longer need to print programs. This savings keeps ticket prices lower for attendees like you. Everyone wins! In the event venue, the Internet connection is usually not as stable or accessible as you expect. However, even if the Wifi or cell service is down, you can still access key event information (such as agenda, attendee profiles, logistics, etc) within the app, due to our advanced offline mode technology. No need to have multiple event apps clogging up space in your smartphone: just download the Whova app once, and you’re covered for all future events using the app. Because of the number of events using and listed within the Whova app, it can also double as your event discovery tool. Browse through upcoming events near you, or anywhere in the world. Enjoy expanding your network while remaining confident about the privacy and the security of your information (name, image, social links, etc. ), which is only visible to individuals you have exchanged contact information with and to confirmed attendees of the event. You can also choose to opt-out of visibility, hiding your SmartProfile from other users. Our app is 100% free for all attendees. Browse events, build your network, and experience the app to it’s fullest extent without having to pay or maneuver around advertisements. There is no hidden in-app purchases. It’s totally cost free and advertisement free. I am loving this @WhovaSupport app and all of our #SoFabUOTR networking all in one place! Wow! I found an awesome event app by Whova! It is so interactive!